During an opening-bell interview at the 2017 ATA Show, Jim Shockey seemed to be a man in full command of things. Serving as an early-morning host for an Outdoor Channel live streaming appearance on Facebook, Shockey held court about several different subjects, all while appearing to be at total ease as he guided online viewers and answered questions, often withhis trademark smile and good humor. But when the Outdoor Channel and Sportsman Channel outdoor television show host of such award-winning programs as UNCHARTED, Jim Shockey's Hunting Adventures and Jim Shockey's The Professionals was asked one question, he grew serious and a bit contemplative. The question? What was the most challenging game animal he had ever hunted? "That's kind of a (difficult) question," said Shockey, the Canadian hunter who has traveled all overthe world seeking hunting adventure and great outdoors programming. But difficult or not, Shockey quickly had an answer. "There's a point in every hunter's career where they have to make a decision (and ask) is this asfar as I'll ever go and is this as difficult and as hard as I ever want to push myself?," he told the online audience. And believe it or not, Shockey had such a moment earlier in his legendary career. 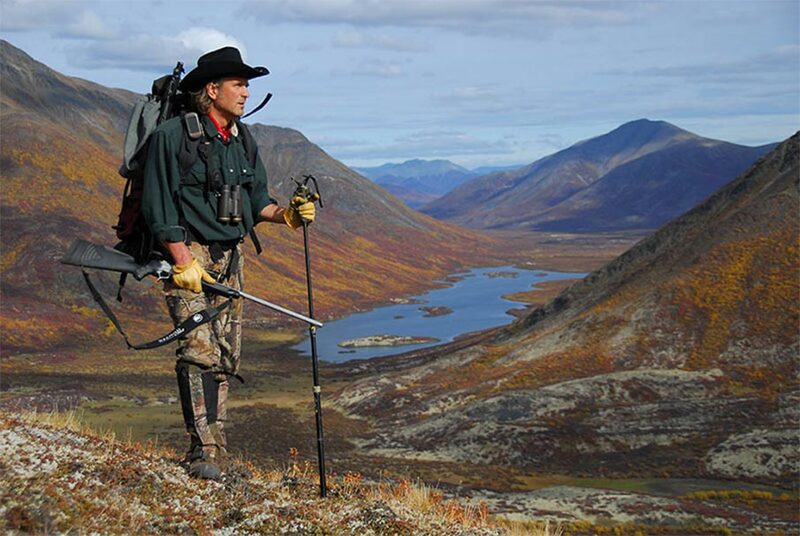 "For me, that was a hunt back in the early '90s for Dall sheep in the Yukon with a guide named Rod Collin, one of the greatest guides I've ever been with, one of the toughest, a tough, tough, tough guide," said Shockey. "We were backpacking (on that hunt) and we had enough food for eight days." The only problem? Shockey said that the hunt went longer than expected. "By day 10, I was eating gophers, literally," he said. "(It was) cold and wet and miserable." And that's when Shockey started wrestling with a voice that he was hearing in his head. "There was a ram there (in front of us) and I could have shot it," he said. "I was beat, I thought Iwas at the very limit of my strength and my ability (and) I wanted to shoot a ram (on that hunt)." So he was highly tempted to gently squeeze the trigger and send a round downrange. But what happened next was one of the biggest and most defining moments in Shockey's long and varied hunting career from one corner of the globe to the other. "Rod (looked at me) and said you can shoot that (ram)," said Shockey. "But then you're going tolook at it for the rest of your life on your wall and you're going to know that you quit, that you quit on this hunt. You got the animal but that doesn't mean anything, that's not success, that's not the measure of success." As the wind blew on the side of a rugged Canadian mountain, Shockey looked deep within the recesses of his hunter's soul. "I had to look deep inside myself and say 'Am I going to quit right now or is there more inside of me that allows me to push farther and to go longer even with no food and being in the freezingcold and not having the right equipment?," he said. "You know, what do I do (in that situation)? I kind of did a little introspection and decided 'No, I cankeep going.'" And he did, on that hunt and the many more that have followed. "That was the most difficult hunt for me because I had to cross over that Rubicon to the point that I realized that 'Oh no, there's nothing that can stop me," saidShockey. "There's nothing, nothing out there that I can't overcome, nothing that I can't face, nothingthat I'm afraid of," he added. "Just go, just go. That was the most difficult hunt for me because of (answering that question) of do I go higher or do I go downhill?" Ever since that day, Shockey has pushed higher, deeper, farther in his quest for pursuing some of the world's most amazing big game animals, recording it for Outdoor Channel and MyOutdoorTV.com viewers and in pushingfor worldwide conservation measures. Take, for instance, some of his hunting and filming plans coming up during 2017. "I have to say that we're going to a place that even makes me question the sanity of shootingUNCHARTED (this season)," said Shockey. "We're headed to Somaliland, which is a part ofSomalia. "This is (where) Black Hawk Down (took place), (in) Mogadishu. This is a bad, active place. I've got to take a special gun that is subsonic so that the bad guys can't hear (it) andpinpoint (us)." And yet, Shockey is ready for the adventure, albeit for more reasons than one. "I'm really excited about it," said the winner of multiple Outdoor Channel Golden Moose awardsfor his filming and production efforts. "We've actually raised the financing, the funding for Somaliland to create their first nationalpark," Shockey continued. "There is no national park there. It's a war-torn country that's rife with politicalupheaval. "We're going to go in there and help set up this national park. And also I've got a doctor from theUniversity of Colorado who is coming to set up an actual wildlife management program that will hopefully end up being pro-hunting." What type of wildlife management efforts will take place? "We're doing a census for all of the wildlife species there," said Shockey. "I'm goingto be there as a part of this huge project funded 100 percent by hunters. The well-known Outdoor Channel hunting and television personality is taking a similar mindset into this dangerous yet exciting adventure. "It's just a tiny little antelope but that's not the point," said Shockey. "It's the journey to that place, surviving while you're there, then getting out and (all of it) ending up on TV (without) a ransom note tucked to my back. "I'm really excited about that one." Shockey acknowledged that this is a very difficult trip with a lot of complexity involved in the travel, the hunting, the filming and in doing important conservation work. "But in the end, in the end, hunters can be proud to know that they will have set up the first national park," he said. "(And that's) in a war-torn country, before any of the animal rights people got in there and set up their ridiculous programs with non-hunting (measures), which basically ensures all of the animals die." Shockey went on to say that "... the animal rights guys don't care about wildlife, they care about stopping hunting." But that isn't the case for hunters willing to go and invest dollars and blood, sweat and tears into giving wildlife species value and conserving them and their habitat for years tocome. "It will be hunters that protect the animals with the national park, with a wildlife management plan that is pro-hunting," said Shockey. "And hopefully, if I can raise a little bit more money, maybe a big cat rehabilitation center as well." If that sounds difficult, well, it is. But don't bet against Jim Shockey to do it. Because ever since a certain day on a cold, rainy sheep hunt on the side of a mountain in the Yukon province of Canada, Jim Shockey has lived a life that isall about defying and overcoming the odds. With the whole world watching on television and online.